The other day, I bought a few tomatillos for making some salsa, but then decided to go with something closer to home- a dal. I grew up on simply fabulous Indian food and this fruit was not something I had ever seen or even heard of before. It continued to remain unfamiliar to me even after I came here. I remember seeing tomatillos in the produce section of my grocery store here and always thinking of them as green, unripe tomatoes. Thanks to blogging, I know a lot more these days and am also less afraid to experiment. This is how I “Indianized” the tomatillos. Heat oil in a pan and add the ingredients for the seasoning. Add the shallots and cook till translucent. Add the cubed tomatillo pieces and cover and cook for about 5-7 minutes or until the pieces turn soft. Mix the ground paste along with the cooked mixture and cook for another 3-4 minutes. Now add the cooked dal along with the desired amounts of water (depending on the consistency desired). Bring to a boil and turn off the heat. This turned out to be a very good, spicy and tangy dal. The tomatillos make a very nice addition and lend a very tart, almost lemony flavor to the dal. I don't find tomatillos here! :( Dal sounds good! Mmm. the dal looks delicious. the picture is of tamatillo is superb. why don't you send it to click event? Wow thats a interesting recipe, never heard of this.. quiet easy too. Looks delicious! Adding tomatillos to the dal is a great idea...normally i add tamarind /kokum to get a tangy flavor, this seems like a good alternative. Beautiful photograph as usual TBC. Indianize and assimilate! Did i miss your au naturel entry? Lovely dal, TBC. I sometimes pick up tomatillos to use in a version of green tomato masial. They taste wonderful. Why do you torture me with this delicious dal! 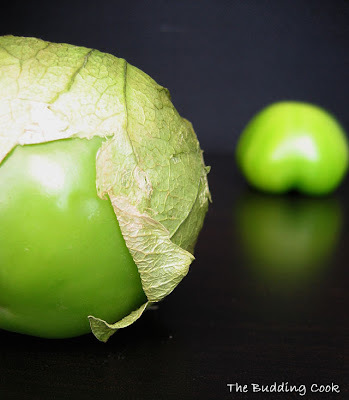 Love that tomatillo pic... You know in Kerala we did have tomatillo plants, but nobody ate the fruit, don't know why! Easy but absolutely fantastic blend of flavours! And your header picture is gorgeous! a wonderful new recipe for tomatillos. looks n sounds gr8. Rajitha- When did I get mad at ya for complimenting my pics, huh? Sra- ooh moong dal and coconut milk- the stuff yummy pradhamans are made of! I don't think I 've made a curry with that combo though. Do u have a recipe for it on your blog? Tee- how have you been? I have not seen u around in a while now. I make dal with kokum following one of Trupti's(The Spice Who Loved Me) recipes. It tastes really good, doesn't it? No you did not miss my entry...I did not send one across this time. Kalai- That is true...yeah I could have called it a kootu too. But it would have to be of slightly thicker consistency, right? Vaishali- I am going to look masial up. I have heard of it before but can't quite remember now what goes into it. Do you a recipe for it over at your place? There are tomatillo plants in Kerala?! I did not know that. Lisa- thank you. :-) You mean my first pic, right? The dal is really very simple and tasty. Do try it out. Thanks for stopping by my blog TBC. You have a great blog here with some innovative recipes. I am sure going to try a few of these! I have given you a blogging with a purpos award. I really enjoy reading your blog. Thanks! Hey TBC, I have a surprise for you.. Check out my latest post. Wow this dal looks really yummy and tangy.Nice colour. Lovely idea, TBC! This gets tried soon! Court cooks- welcome to my blog! Thank you for thinking of me and for the nice words. Sukanya- thnaks! :). I hope you like it as much as I did. Hey thanks TBC, thats very sweet of you. Wow. Amazing photo. I have never cooked with these, so it was interesting to see your take on them. Vegeyum- thank you. :) Hope you are on the mend now. I have started using these only recently. TBC- this is one great recipe. 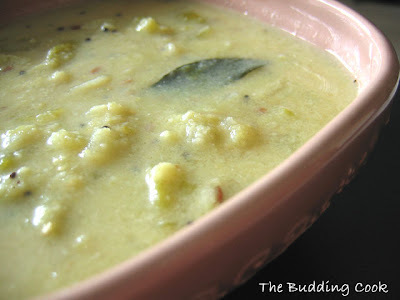 I llike the idea of combining tomatillos with toor dal.Shall try it out soon.